Hello everyone. Today I'm back with another card using some Lawn Fawn supplies. 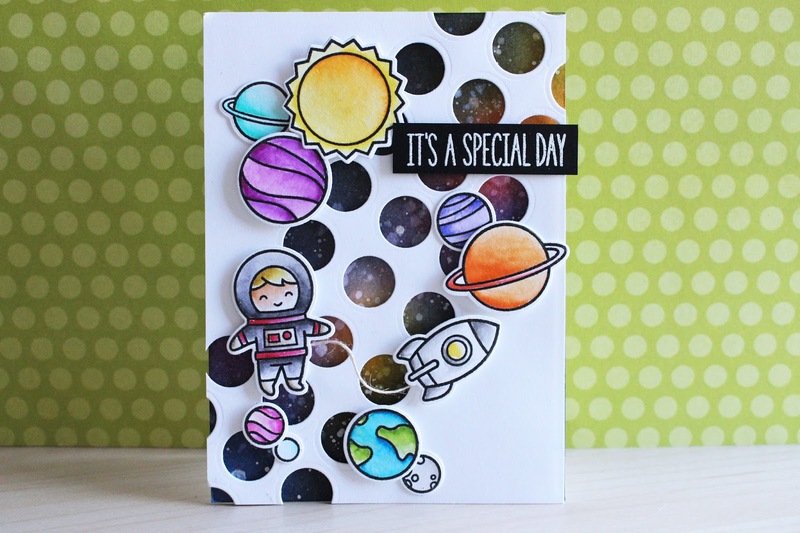 I'm using the Out of this World stamp set along with the Owen's ABC dies. To begin my card today I first stamped out all my images using Versafine Onyx Black Ink and then used clear embossing powder over top to let my images have an edge on the lines to contain the watercolour a little better. I then used my Zig Clean Color Real Brush Markers to colour in my images. I love these markers for quick and easy colouring. I used all colours of the rainbow today for colouring as I want it to be a fun and whimsy birthday card. Once all my images were coloured I die cut them out using the coordinating dies. Next up was my background panel. I used the Owen's ABC dies to cut the circles repeatedly out of a piece of white cardstock in a diagonal. Once they were all run through I moved onto my coloured background. For my coloured background I used various Distress Inks to create a galaxy so that would peak through the circles that were going to be laid over top. I used some yellow, purple and pink to create pops of colour and then blues and blacks to make it look like a galaxy. I also flicked on white paint and water to create stars. I dried it off with a heat tool and adhered my die cut panel over top using foam tape. Once everything was mounted I added the entire panel onto a card base and then adhered all my images using foam tape as well. I also used some hemp cord to attach the astronaut to the rocket. To finish up the card, I needed a sentiment. I used the 'It's A Special Day' sentiment from the same stamp set and white heat embossed it onto some black cardstock and also adhered that with foam tape and that was the card complete. I hope you enjoyed the card today and got inspired. Thanks so much for stopping by and I'll be back real soon!